Full functionality across all devices. Smart Phones – IPhone, LG, Samsung, etc. Tablets – IPads, Surface, Android, etc. Laptops – Microsoft, Apple, Google, etc. PC’s – Microsoft, Apple, etc. Browsers – Chrome, Safari, Edge, IE, Firefox, etc. 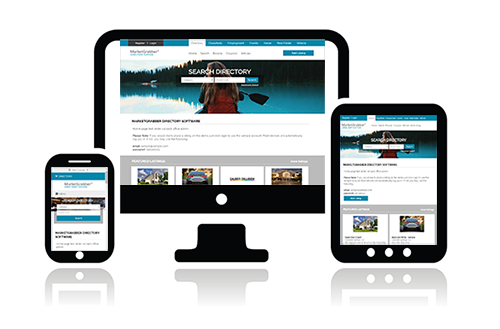 Fully Functional - Your customers can use all of the functionality of your website from a phone, tablet or PC. Customers can view content, login, create listings, upload photos and logos, share site content contact advertisers, etc. Search Engine Optimized – Your site is automatically marked as “mobile friendly” in Google search results and makes it easier to appear in phone and tablet searches. Socially Engaged – Customers on phones, tablets or PC’s can easily share content to Facebook, Twitter, Linked In, Pinterest, etc. Adapt to Device Used - Automatically adapt their look and feel based on the size of the device being used. All photos, graphics and display ads (including Google ads) automatically resize. Touch Friendly - All links buttons, sliders, etc. are touch-friendly – no mouse required! Reduce Maintenance Costs – No need to maintain the same content in a mobile and non-mobile version of a site. Reduce Customization Costs – No need to reproduce the same customization in a mobile and non-mobile version of a site.